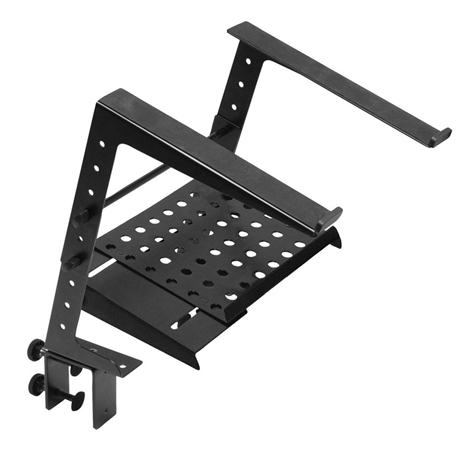 Shop On Stage LPT6000 Multi Purpose Laptop Stand from AMS and enjoy Fast & Free Shipping. Light and portable, the LPT6000 is ideal for holding your laptop, CD player, EFX machine or lighting controller. This versatile design can stand alone on any flat surface for quick and easy set-up, or clamp to virtually any table, rack case or even DJ equipment. Features 4 easy line-it-up height adjustments, 3 pre-set widths and an angled platform with front bumpers. An included center rod extension accommodates larger laptops/equipment. All contact surfaces are covered with EVA rubber to prevent damage or scratching to mounting surface and equipment. The LPT6000 adds a 2nd level tray for additional laptop equipment and/or accessories. Workd perfect and priced right. Better than the one I had. Had to replace the one I had, this one is better and better priced. Works perfect.